According to the Internet, the islands of Japan are populated by hordes of cute animals just waiting to make new friends. 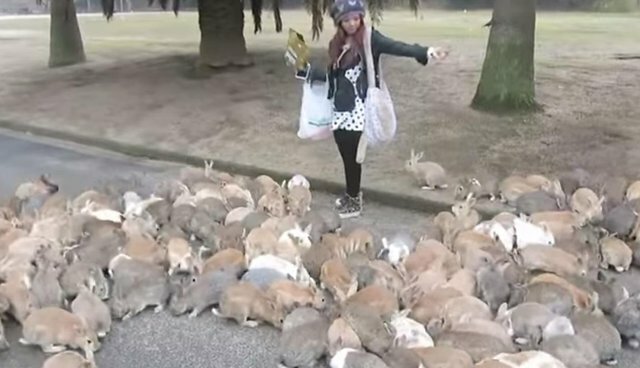 Thanks to a viral YouTube video last year, viewers from around the world could see that not only is there an island of wild bunnies, but there are also bunnies who apparently chase down people for snacks. Online photo galleries showcase hundreds of feral cats that roam another island in the north and outnumber the human residents. 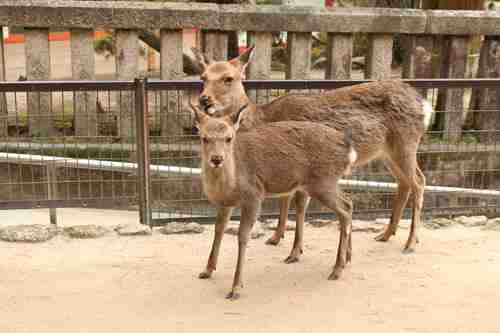 And due to the popularity of those two, other Japanese islands of wild animals (such as deer and monkeys) have begun to crop up online. But how about in real life? We set out to visit two of the islands to see if reality could live up to the viral potential. 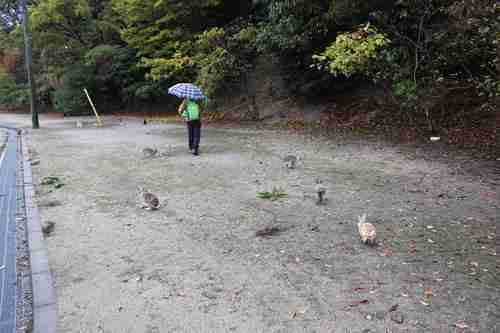 Just outside Hiroshima is the island of Okunoshima, or as everyone on the Internet knows it, Rabbit Island. About once an hour, a small ferry with enough room for a dozen passengers takes off from the port of Tadanoumi and reaches the shores of the island within 10 minutes. The moment visitors make their way up the ramp from the boat, bunnies are everywhere to be found. A free shuttle bus waits at the port ready to shepherd visitors to the only hotel on the island. Jump on and you'll pass plenty of cotton-tailed comrades - littering the roads, hanging out under awnings, all very much looking for their next meal. There are scores more when you finally arrive at the hotel grounds, which is the most populated place to view them. 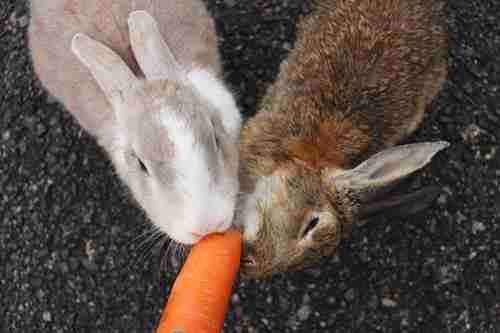 While you can buy rabbit feed at the hotel for a fair price, the hot tip is to buy fresh vegetables before you reach the island. The rabbits are ready and eager to be fed, and the funniest thing is that they're more interested in being fed by hand than having you simply drop pieces of food onto the ground for them. 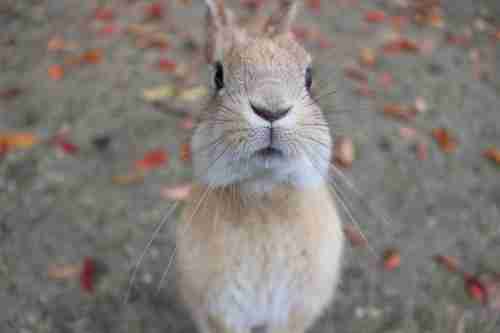 They'll paw at your ankles and stand on their hind legs begging for a treat. While they'll submit to a pet here and there, they're definitely only interested in the food, and they can be pretty aggressive with each other in trying to get it. Other than the attraction of meeting rabbits, the island looks like a jungle, alive with bright green ferns and abundant shrubbery. Trails lead around the island and up to its peaks, where you can see out to the many islands that surround it in the Seto Inland Sea. During World War II, the island produced poison gas, and abandoned military buildings litter the island as remnants from that era. The scenery and vibe are reminiscent of the TV show "Lost," especially when you're out walking in the dense foliage and suddenly you happen upon cement enclosures that looks like the Hatch. But it's not only that: At any moment you'll see the shrubbery shaking as something inside its leaves makes it way toward you. Is it the black smoke monster? A polar bear? Though it turns out to be a bunny every single time, that doesn't make the anticipation of the reveal any less terrifying. They'll come from any direction at any point on the island and surround you in an instant, though often in smaller numbers than in any of the viral videos posted about the island. Farther south, but still in the waters of the Inland Sea, is the island of Miyajima. While the island's given name is Itsukushima, even train and ferry tickets use its popular name, which means "shrine island." 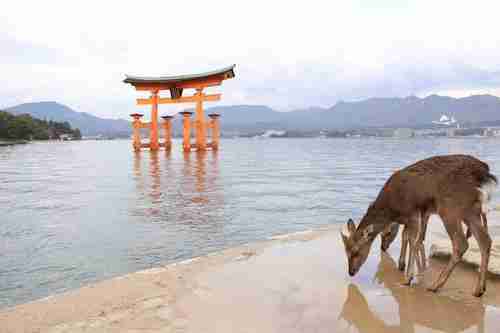 It's well-known for three things in particular: the bright orange torii gate that greets visitors from the water in front of the Itsukushima shrine, the world's largest rice scoop, and the wild deer that walk its shores. Ask an official in the tourism booth at the port where to find the deer and they'll give you a one-word answer: everywhere. Yes, from the moment you step off the ferry and exit the port, there's an abundance of deer just waiting to devour tourist maps and anything else they can get their mouths on. And even though they're a big part of the tourism draw for the island, feeding them is not encouraged, so what you'll find is a bunch of hungry and expectant deer that can't quite catch a break. They trot down the main roads, curl up in groups near Senjokaku, the Hall of One Thousand Tatami mats, wait expectantly outside restaurants, and stand at the torii gate vantage point ready to photo-bomb any and all tourists in hopes of scoring a small treat for their efforts. They'll submit to pets, but only in hopes of some kind of reward. For the safety of visitors, their antlers are removed, and only the youngest deer still have antler sprouts. Towering above all is Mount Misen, the highest peak and arguably the holiest place on the island. You can climb the mountain or take the ropeway, an aerial gondola system, as a convenient alternative. Midway to the summit is the Reikado, where a flame lit by Kobo Daishi - founder of the Shingon sect of Buddhism - has been burning without fail for 1,200 years. Will there be deer? Of course! Walk the final meters to the top and hoofed friends just might be pacing the stony tan sands of the summit. There's even a chance you'll come across the silver-haired Japanese macaque monkey, though they're not so common on the island these days due to relocation stemming from overpopulation. However, if you're going to see them while on the island, the summit is their top spot. So how does reality stack up to the Internet in the case of Japan's animal islands? Is it worth a visit or better to simply scroll over from the comfort of your own home? While it's nearly impossible to re-create the rabid feeding frenzy seen in videos of Okunoshima (since feeding rabbits on the actual roads isn't allowed), it's still a super unique way to spend a day and about as quirky a trip as you can find. It's definitely worth it for the Instagram-ability if not for the experience alone. And those deer? A true highlight! 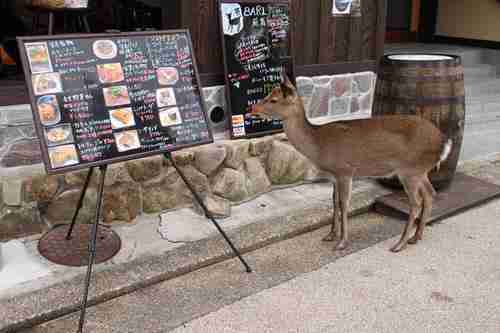 There's the alternate option of staying on mainland Japan and simply visiting the deer of Nara, a city outside of Osaka. But by journeying to Miyajima, you're also able to witness one-of-a-kind shrines and traditions that date back several centuries, which rounds out the experience into one that's truly unforgettable. When you're riding the ropeway down the mountain, it can feel as if you've stepped into your own adventure story, where every footstep you take turns another page. The cost to scroll across a post on the animals of Japan's islands is however much your bandwidth costs per month, but the opportunity to cozy up to one in a photo of your own? Priceless!